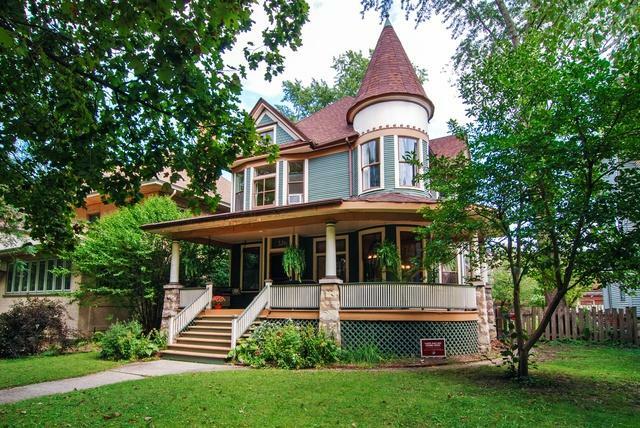 Haven't you always wanted to live in a turreted charmer? This Painted Lady is for those who appreciate history & original details. 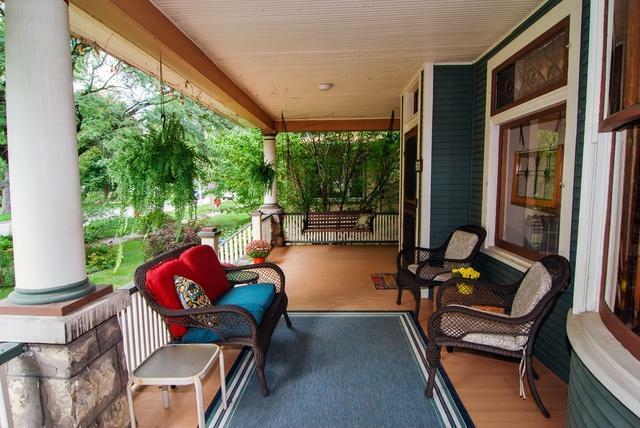 Wrap-around porch w/ swing. Spacious foyer. Lovely orig. woodwork abounds. 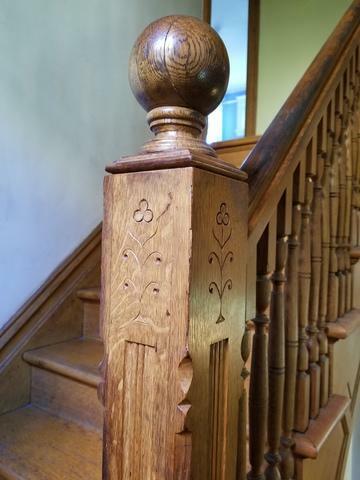 Charming carved newel posts. Double parlor. Corner fireplace with orig. tiled surround. Working pocket doors. Art glass windows. Five orig. light fixtures. 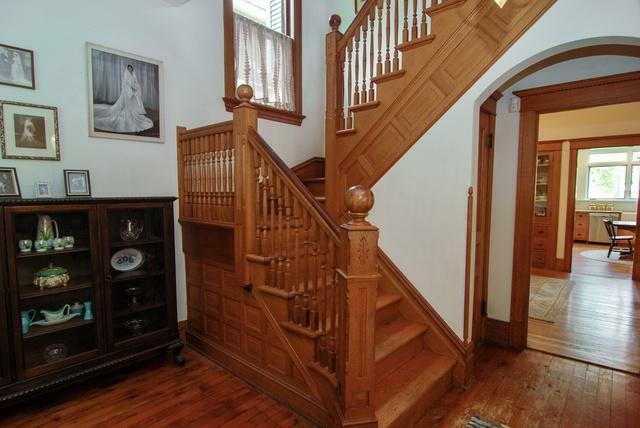 Front & back stairs. Transoms above every bedroom door. Remodeled, huge, sunny kit w/ custom quarter-sawn oak cabinetry, SS apps, & granite counters. Modern powder room. Tiered deck. En suite 1/2 bath each in middle bedroom & master w/ sitting rm. Large closet w/ built-ins in 4th bedroom. There's even a dark room in the semi-finished attic for you retro hobbyists! Extra parking spaces easy to rent. Lovely block w/ friendly neighbors! Newer tear-off roof, boiler 2014, washing machine 2016, newer dryer. DW, fridge, powder rm & partial CA all part of Kitchen re-do 2008. This home has a lovely feel you won't want to miss! © 2019 Midwest Real Estate Data LLC. All rights reserved. IDX information is provided exclusively for consumers' personal, non-commercial use and may not be used for any purpose other than to identify prospective properties consumers may be interested in purchasing. Information is deemed reliable but is not guaranteed accurate by the MLS or The Wexler Group. The data relating to real estate for sale on this website comes in part from the Broker Reciprocity program of Midwest Real Estate Data LLC. Real Estate listings held by brokerage firms other than The Wexler Group are marked with the Broker Reciprocity logo or the Broker Reciprocity thumbnail logo (a little black house) and detailed information about them includes the names of the listing broker. Some properties which appear for sale on this website may subsequently have sold and may no longer be available. NOTICE: Many homes contain recording devices, and buyers should be aware they may be recorded during a showing. Data last updated: 2019-04-22T22:51:52.56.